Republicans in Congress and President Donald Trump achieved nothing more than a nonstarter in their failed first attempt to reform healthcare legislation as promised during the 2016 presidential campaign. Despite Trump's assurance that passing his proposed legislation was just one phase of a larger healthcare reform plan, even phase one could not be accomplished due to differences within the GOP ranks in Congress. Democrats were never expected to support a repeal of the Affordable Care Act, also known as Obamacare, but after being on the sidelines during the first round, they could now play a key role in giving Trump a legislative victory on healthcare. 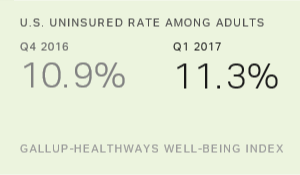 Perhaps because of the public attention given to the chaotic and highly visible process of revamping Obamacare, U.S. public approval of the ACA has actually increased since the election, from 42% approving and 53% disapproving in November 2016 to 55% approving and 41% disapproving in early April 2017. Most of this increase in general approval has come from Democratic identifiers and leaners who have become more hardened in their support for the ACA. 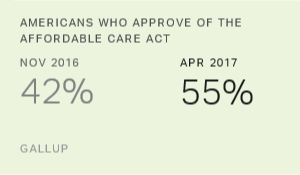 Nearly nine in 10 Democrats (87%) now approve of the 2010 Affordable Care Act, while only 10% disapprove, down from 24% in November. With the Republican Party still reportedly divided on healthcare as members spend two weeks away from Washington during a district work period, it now seems that some Democratic House members may need to vote for healthcare reform to get to the magic number of 216 House members to pass a bill. Even Trump has signaled that the White House may increase its outreach to Democrats, which is a major strategic shift. The Democratic congressional leadership has all along been certain to oppose any replacement of Obamacare since it is the party's flagship for this political era. However, Gallup's 2016 Health and Healthcare poll, conducted shortly after the presidential election in November, revealed rank-and-file Democratic discontent with several aspects of healthcare -- issues that could be addressed in the current session. First, 75% of Democrats and Democratic leaners, as well as 86% of Republicans and Republican leaners, said they were dissatisfied with the total cost of healthcare in the country. So, while congressional Democrats in Washington seem committed to protecting Obamacare, rank-and-file Democrats see the need for more cost controls. Second, even with the ACA as the law of the land, 62% of Democrats and Democratic leaners in November said that the healthcare system was either in a state of crisis or had major problems. The Democratic percentage is only a bit lower than the 80% found among Republicans and Republican leaners. 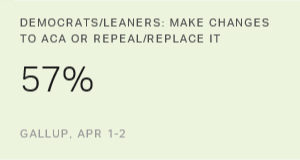 More recently, in an early April 2017 Gallup poll, fewer than half of Democrats (40%) said they want to keep the Affordable Care Act "largely as it is." The majority would either make significant changes to it (52%) or repeal and replace it (5%). If you had to choose, would you rather -- [ROTATED: Keep the Affordable Care Act in place largely as it is, keep the Affordable Care Act in place but make significant changes to it, or repeal the Affordable Care Act and replace it with a new healthcare law]? The reality that not all Democrats are happy with the current law will be "the bouncing ball" in any negotiations that Republican congressional leaders have with Democratic congressional leaders, as a remarkably strong number of the Democratic rank-and-file may not want "repeal" but do want "repair." 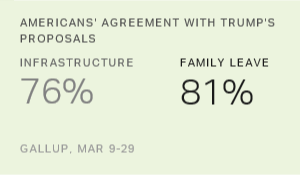 Among Americans as a whole, 26% want to "keep the Affordable Care Act in place largely as it is," 40% want to "keep the Affordable Care Act in place but make significant changes to it," and 30% want to "repeal the Affordable Care Act and replace it with a new healthcare law." The intra-GOP differences in opinion may continue to make healthcare reform exceedingly complicated, as nearly six in 10 Republican rank-and-file want total legislative replacement, while 28% would rather keep it in place but make significant changes to it. House Speaker Paul Ryan noted where all proposed legislation stood at the moment before the spring recess, declaring, "So right now, we're just at that conceptual stage about how to move forward in a way we can get everybody to 216 [votes]." A sizeable portion of rank-and-file Democrats in this country do not want to keep the ACA as is. They want significant changes to the law, possibly stemming from their concerns about the cost of healthcare or their belief that the current healthcare system has major problems. Therefore, if Trump indeed turns to Democratic House members to make a second attempt at a deal for healthcare reform, he might need to remind Democratic congressional leaders in Washington that there is a significant number of Democrats in the country who indeed want reform, if not repeal. Ultimately, there may be little public policy difference among what various factions in Washington refer to as "repeal," "reform," "replace" or "repair." The future of the U.S. healthcare system may come down to how flexible congressional leaders, both Democratic and Republican, are in adopting these key words. Trump's challenge is whether he can achieve what he wants without calling it a full "repeal" -- possibly succeeding with the help of Democrats who can be persuaded that their own constituency believes repair, if not reform, is needed. In other words, the art of the deal over healthcare may be in the art of semantics.